Even though I’ve known for a while that it’s only rock and roll, I’ve still always liked it. I’ve shared a similar feeling with the simple 2D brawler genre, as some fond gaming memories date back to raiding the arcade with friends to play “Teenage Mutant Ninja Turtles” and “X-Men,” or just kicking around at home with “Double Dragon” on the NES. 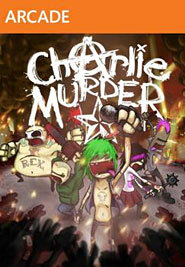 Appropriately, the new Xbox Live Arcade game “Charlie Murder” combines both of those aspects into one title that sees you choose between members of a punk rock band that’s forced to defeat a rival group who are aided by zombies, witches, demons and other forces of darkness through a variety of levels all designed to fit the style of the apocalyptic rocker protagonists. The comic style graphics are certainly the first thing that catches your eye about “Charlie Murder,” but once you start playing, it’s clear that the most noteworthy aspect is the game’s surprising amount of depth. While a part of that is due to the multiple stage types, which include flying and driving stages, as well as timed rhythm based segments (think “Rock Band”), the real selling point of “Charlie Murder” is its RPG aspects. While “Charlie Murder” is a great “Double Dragon”-style 2D brawler, it’s an even better “Diablo”-style RPG, which sees you level up your character’s skills and attacks, upgrade their equipment with creative loot, and make use of various store types to acquire beneficial items like food and skill-assigning tattoos. The combination reminded me of the NES classic “River City Ransom,” and while it’s uniquely entertaining and surprisingly deep on its own, unfortunately, the execution of combining these elements doesn’t always work when it comes to the actual gameplay. It becomes incredibly frustrating to be enjoying yourself one minute — smashing your way through hordes of enemies using a variety of weapons, including their own limbs — to have to then stop and bring up the game’s cumbersome cell phone menu to add skill points or cycle through your inventory. When playing with multiple people, it perfectly recreates the experience of hanging out with your friends and waiting for one of them to stop using their cell phone and get back to the fun.